Wednesday (Where do the Wild, Gophers go from here) edition: Wha' Happened? The most remarkable thing that happened Tuesday is easy to discern. A veteran point guard who started the year as a backup scored 52 points for the Timberwolves, helping them snap a 15-game losing streak and giving them what we have to imagine was the most satisfying flight from Indianapolis to Phoenix in history. Honestly, imagine being Mo Williams on that airplane. Imagine thinking over and over again, “I just scored 52 points! The most in the NBA all season!” Few things in life are as satisfying as soaking in a great accomplishment, and those moments are made even sweeter when the directly follow adversity. That remarkable thing is all that kept Minnesota from, once again, having an across-the-board bummer of a sports night. It was also the only unpredictable thing that happened. The Wild was routed 7-2 in Pittsburgh. The Gophers sputtered, then rallied, lost another lead and had their hearts broken in the end again by Iowa. Those last two narratives are well-worn, but the consistency with which they are playing out combined with some recent maneuvering from the head coaches of both teams lead to a simple question: Where do the Wild and Gophers go from here? The Wild is winless in its past six games. 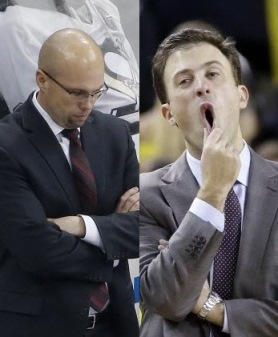 More instructively, the Wild is 0-4 and is being outscored 18-6 since Mike Yeo played one of the classic cards of desperation at a head coach’s disposal: the tantrum. He blew up at players in practice the day after a loss to San Jose. The Wild responded in the next game with improved play, but still a loss, against Chicago. The last three have largely been clunkers — poor play, worse goaltending, no answers. Once a coach has played that blow-up card, and a team has failed to respond, there isn’t much left to do except hit the reset button, wait and hope. That’s not a tactic as much as it is an admission of defeat. The Gophers men’s basketball team is now 0-5 in the Big Ten. Two of the road losses came after losing significant leads. Both of the home losses were back-and-forth affairs that came down to one or two critical possessions in the end — and both times Minnesota came up short. We’re most interested in this last loss to Iowa because in this go-round, Richard Pitino played another of the desperate cards at a coach’s disposal: the lineup shuffle. Pitino, in search of any combination to change the team’s chemistry and fortune, inserted three new starters into the lineup. The Gophers fell behind early, trailed by as many as 17, roared back but again fell. It’s hard to say if the outcome would have been different had Pitino pushed different buttons, but it is easy to say this: what he tried didn’t have the desired effect at the start or finish of Tuesday’s game. Much like the Wild, the Gophers are now left in a position of hitting the reset button, waiting and hoping. Those two winter teams entered the season with legitimate postseason aspirations. Now they both just want to win a game. But cheer up, Minnesota sports fans. As long as Mo Williams can score 50 points every game, not all hope will be lost.